That's not the interesting part. The question is: How did the hats get up there in the first place? 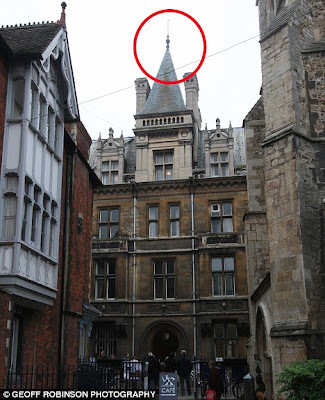 As you can see from the photos above, the hoaxster didn't choose the most accessible rooftops. 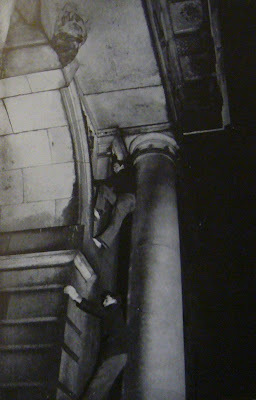 That's why some are suggesting that the hoaxster must have made use of a book known as The Night Climbers of Cambridge. Written by the mysterious "Whipplesnaith" and published in 1937, the tome offers a guide to exploring the roofs of the city's ancient buildings. It even offers handy tips on how to get around chimneys, pillars, and gargoyles. Want even more awesome? (I can barely take it!) You can read the entire book here. Ooh, that reminds me of this part in P.L.A.I.N. Janes where they put knit hats and scarves on everything in town, like mailboxes, streetlights, and fire hydrants. Only waaay more challenging and impressive. CAN'T TAKE THE AWESOME *moves to england* I need an actual Glimpses of Gotham. Santa Hats on old buildings is soooo funny, it is also a very amazing feat. It reminds me of both "P.L.A.I.N. Janes", and "The Disreputable History of Frankie Landau-Banks". Fun! I wish I would do that! I am in extreme awe over that book. Wowz. Wow. That is awesome. And I so want a book like that. Sweet! I want to study there! Hey a few years ago the M.I.T. 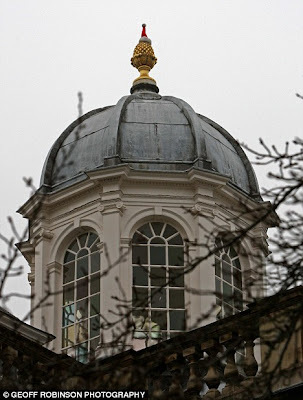 students in Cambridge got a car on the roof! They are geniuses! There was actually a fictional novel about the Night Climbers (called, predictably, The Night Climbers) by a writer named Ivo Stourton published last year. It's quite good.